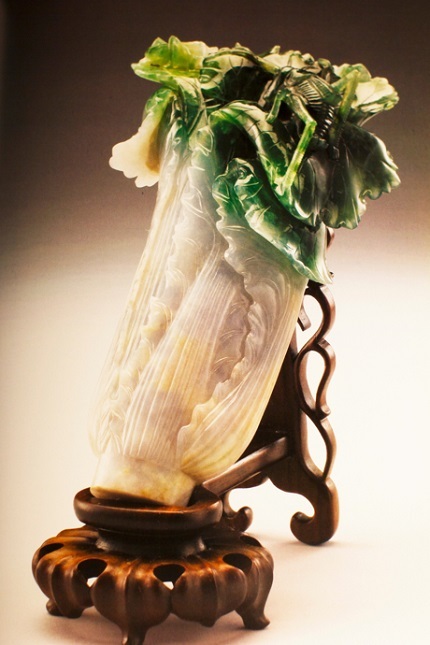 During a visit to Taiwan in September, we visited the National Museum in Taipei and saw one of the world's great works of art, the Jadeite Cabbage. An unknown Chinese artist apparently in the nineteenth century took a highly flawed piece of jade with uneven color, blotches, cracks and veins, and used those flaws as part of the design. The white stone became the stalk of a cabbage and the darker green regions became the leaves and a couple of magnificent insects. Cracks became delicate veins on the stalks. In the end, the work was far more beautiful and lifelike than if it had been made from flawless uniform jade. It was almost as if the jade had been designed to be a cabbage, but this was really the result of the hand of the master making the most of imperfect raw materials. What a fitting analogy for how the Lord deals with our flaws, if we'll let Him sculpt us. I was pleased to see that the Oct. 2014 Ensign has a brief article making this point (Ellen C. Jensen, "The Jadeite Cabbage"). This sculpture is the highlight of Taiwan's National Palace Museum, which contains much of the most precious art that once was in the Forbidden City in Beijing, brought to Taiwan by Chiang Kai Shek. For most visitors it is the leading attraction of that splendid museum. There are many ways the Lord can turn our flaws into something better and even help us find good or do good in the midst of the chaos we create, when we repent and turn to Him. Sometimes the craftsmanship is so fine that we might mistake our flaws for virtues or even our sins for things there were somehow "meant to be." On my mission, there was an outstanding elder who broke a bone while playing basketball. Our mission had a specific rule against basketball, probably because there had been so many injuries like the one that put this enthusiastic elder in the hospital for a number of weeks. While there, though, he didn't cease from sharing the Gospel, and gave some copies of the Book of Mormon to the staff, including one nurse who seemed interested in the message. Later, in a testimony meeting, that Elder shared his belief that his whole experience there in the hospital might have been divinely arranged in order to reach that nurse and maybe some others. I can understand the feeling, and in a sense, he's right — but had he kept the mission rules a little more strictly, he would not have had that injury. So was it God's will that he break a mission rule in order to reach the nurse? That might not be the right way to look at his situation. Rather, wherever we end up, there is always good to be done, and as we seek the Lord, the experiences, even our failures, will seem tailored and meaningful. Just don't confuse a good tailor for a great physique. God is a master tailor and can craft things to fit us perfectly, even when we are in pretty bad shape. Frankly, we are all off course, somewhere other than where we would have been had we lived perfect lives. Yet wherever we are, the Gospel tends to help us experience miracles, blessings, comfort, and meaning that makes it seems like this error-ridden path was designed and tailored for us, even intended for us all along. Alma the Younger's story would have been much different and perhaps much less interesting and less helpful to us today had he not been a rebel. The good that he was able to do after repenting does not justify the harm he did before, and surely as a mature prophet he wished that he had never departed from God in the first place, but we can praise God that such a flawed rebel was able to become such a powerful tool for good. Do not doubt the good that God can do with you now and the mess you may have already created in your life. Follow Alma's example and do all you can to let God guide you with His hand, and you will find beauty and surprise in the end. We must repent and move forward with hope rather than beat ourselves up over the permanent departure from the imaginary state of what would have been ideal. The unwed mother, the divorced couple, the missionary sent home for some foolish error, the driver whose mistake creates tragedy — all these may be painful departures from the ideal, and yet the Lord can be there for each of these parties and bring them through the pain to find new meaning and blessings that are uniquely crafted for who and where they are. I think there is a better way to understand what happened to the missionary brought down by basketball and what happens to all of us when we fall in some way but seek God's guidance. It's not that all our departures from God's paths were actually secret shortcuts that we were destined to follow according to God's will. Rather, God's hand guides us to experience growth, do good, and find paths forward no matter what ditch we've driven into, no matter how deep in the mud of some no-man's land we managed to wander into. Like the GPS that continually revises the suggested route after our errors in driving, God keeps working with us to bring us forward, if we'll accept guidance from His hand. The journey we take and the destinations we encounter may be much different that they might have been, but He is there to guide again and again and again, and along the way, we will have miracles. As we work our way back to the main road, there may be stragglers we can use a lift. Miracles, love, service, healing — these things never cease if we are willing to let God work with us. Yes, they may be designed and tailored for us, allowing us to be in the right place at the right time, even after we've wandered leagues from where we were really "supposed" to be all along. In one sense, to recognize the hand of the Lord in all things (Doctrine & Covenants 59:21) might be to see that His hand is always there in our lives, pointing, beckoning, holding, helping, pulling, lifting, blessing, and crafting beauty out of the flawed raw material that we are. When we see the beauty and the good that come from such flaws, let us not admire the flaws, but the Craftsman.